8/3 Cup of Coffee: The fallout from the moves made on Tuesday's non-waiver trade deadline are still being felt, as promotions and debuts at different levels have kicked into gear. Travis Lakins made his Pawtucket debut two days after moving up from Portland. Word came out after the Portland game that Josh Ockimey and Mike Shawaryn would join Lakins in Pawtucket and Bobby Dalbec would move up to the Sea Dogs. Ockimey blasted his 15th homer of the year to help Portland to a doubleheader sweep in which it outscored Erie 14-1 and outhit them 21-9. Top prospect Michael Chavis led the way in the outburst, reaching base six times in the two games. It was a marathon loss, as Pawtucket missed out on its chance to salvage a split in the four-game series. Travis Lakins, promoted to the PawSox on Tuesday, made his Triple-A debut when he came on with two outs in the fifth. He went a scoreless 1 1/3, striking out a pair and allowing a hit. The Chiefs will be happy to see Sam Travis leave town, as the first baseman was 2 for 5 and collected eight hits in the series. Rusney Castillo and Ivan De Jesus added two hits apiece. Home runs reigned in the opener of Portland's doubleheader romp. On his final day in Double-A, Josh Ockimey got the party started with a second-inning solo home run. Michael Chavis had a fourth-inning blast, to go along with a single and walk. Luke Tendler and Chad De La Guerra joined the festivities with a homer apiece. The offense provided more than enough support for Matt Kent. The lefty returned to Portland from a spot start in Pawtucket to allow a run on five hits in six innings, striking out five and walking one. Kyle Hart dominated in the nightcap, firing a seven-inning complete game shutout. Hart gave up just two hits, striking out five, walking two, and throwing 67 of 102 pitches for strikes. Chavis was on base three more times, grabbing a single and pair of walks along with a run scored and stolen base. Austin Rei ripped a two-run homer, and Ockimey closed his Portland chapter with his 19th double of the year. Heavy rain made play in Lynchburg impossible on Thursday, washing out the final night at Class A for Bobby Dalbec. The teams will make up the contest when the Hillcats visit Salem at the beginning of September, with a specific date not yet determined. Fluor Field was also unplayable on Thursday, and the two teams will try again on Friday with a doubleheader scheduled for 4:00. Tyler Dearden launched a solo home run in the top of the first inning and the Spinners never looked back. Eduard Bazardo got the start for Lowell, allowing two runs on six hits in 5 2/3. It was only the third start of the season in which Bazardo has allowed more than a single run. Kris Jackson scattered three hits across two scoreless innings to pick up his third save since joining Lowell. Jackson is yet to be scored upon in seven innings across five appearances with the Spinners. It was a very DSL ending to the 10-inning contest, as Jesus Maita raced home with the winning run on a wild pitch. Starter Felix Cepeda struck out four in two scoreless innings, surrendering just one hit. Jeison Pena did the grunt work out of the bullpen, going six innings of relief, allowing a pair of runs, and striking out five without issuing a walk. Osvaldo De La Rosa got credit for the win with his two shutout frames. It was a dominant performance by the Sox in their rout of the Rays. Brayan Bello and Isaias Ozoria combined on the one-hit shutout. Bello went six innings and surrendered the Rays' lone hit, a fifth-inning single. He struck out two and did not issue a walk, lowering his ERA to 1.52. Ozoria walked two and struck out three in his three hitless innings. Kleiber Rodriguez led the way at the plate, launching a two-run homer as part of a 4-for-5 afternoon that included a double, three runs scored, and four RBI. It was the first home run of Rodriguez's pro career. Yulis Hernandez drove in three as part of a two-hit effort. 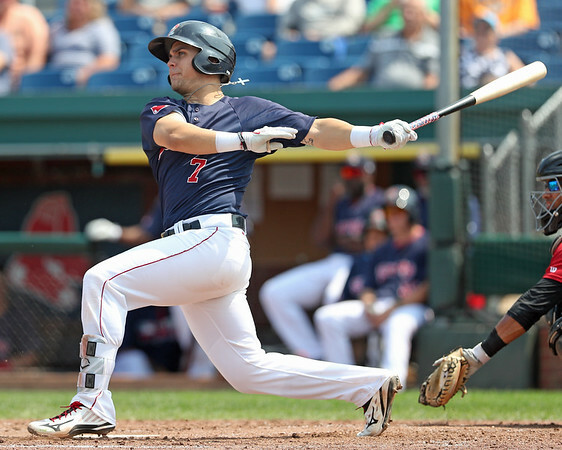 Player of the Day: Portland's impressive drubbing of Erie was made possible by a monster afternoon from top prospect Michael Chavis. In his 13th and 14th games since rejoining the Sea Dogs, Chavis homered, doubled, singled, and walked three times, recording only two outs in the doubleheader. With his big day, the 2014 first-round pick raised his season slash line from .152/.264/.326 to a much more palatable .196/.328/.412.